Kawasaki's Jonathan Rea set the fastest time overall during free practice at Portimao in Portugal on Friday. Jonathan Rea posted the quickest time in free practice at Portimao in Portugal on Friday as the Kawasaki sets his sights on a third consecutive World Superbike double. Rea led the way in FP1 and FP2 on the Ninja ZX-10RR, although Italian Marco Melandri bumped the Northern Ireland rider back to second in FP3 by 0.3 seconds after lapping at 1m 42.003s. However, Rea’s time of 1m 41.817s set during FP1 in the morning topped the leader board on the combined times from day one, putting the reigning champion 0.186s ahead of Aruba.it Ducati rider Melandri. Rea, who crashed at Turn 6 unscathed in FP2, has won the last four races held at Portimao and is aiming to pick up where he left off prior to the long summer break, when he chalked up double wins at Laguna Seca and Misano. The 31-year-old leads the championship by 96 points from Chaz Davies (Aruba.it Ducati), who was languishing in 15th place on Friday after his Panigale R caught fire after a crash, rendering him unable to complete FP3. 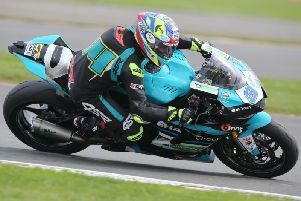 The Welsh rider, who was unhurt, will now have to qualify from Superpole 1 on Saturday. Spain’s Jordi Torres (Reparto Corse MV Agusta) was third fastest ahead of rookie Toprak Razgatlioglu (Puccetti Kawasaki), with Toome man Eugene Laverty fifth on the Milwaukee Aprilia. The top six was completed by Span’s Xavi Fores on the Barni Racing Ducati. Race one is scheduled for 13:00 BST on Saturday after final free practice and Superpole qualifying.